Episode 166: "Secrets and Pies"
Intro: Twilight Sparkle helps Pinkie Pie bake a pie for Rainbow Dash. Act 1: Pinkie delivers the pie to Rainbow but finds it in the trash moments later. Pinkie realizes she has never seen Rainbow eat one of her pies. Suspicious, she questions the Wonderbolts, Dr. Fauna, and Cheerilee and concludes Rainbow has been lying about enjoying her pies for years. Act 2: Applejack confirms that Pinkie's pies are good but that she hasn't seen Dash eat any. Pinkie tries to arrange situations where Dash is forced to eat a pie in front of her, but all attempts fail. Finally, Dash's lying is exposed in front of Pinkie at a public gathering. Act 3: Pinkie and Dash are no longer on speaking terms, and AJ and Twilight are also angry. Rainbow gets Pinkie's attention by threatening to eat a pie out of garbage. Pinkie stops her, realizing that Dash had been motivated by Pinkie's excitement whenever she thought Dash had enjoyed one of her pies. Character: Let's get the easy part out of the way first. I like seeing Twilight baking with Pinkie. The two don't get a lot of casual time together in this series, and it's a nice follow-up of sorts to Twi's baking contest with Spike a few episodes ago. Applejack is well used here as a level-headed friend for Pinkie and as the Element of Honesty to oppose Rainbow's rationalizations. Pinkie Pie is our perspective character, and it appears we're getting the flighty, easily distracted Pinkie from Three's a Crowd and various other fourth-season episodes. More accurately, though, her behavior with Dash has been very trusting, one might even say naive. Ever the optimist, she prefers to imagine the best of her friends, having learned that lesson way back in Party of One. But unlike that story, her friend really is up to something this time. While her imagination is still very active, she also recalls her lesson from MMMystery on the Friendship Express and performs a thorough investigation of Dash before leveling any accusations at her. And she gives Dash every chance to either come clean or prove her wrong by eating a pie. Finally, this story doesn't spell it out, but I believe the reason Pinkie arranges a public pie-tasting is so that even if she doesn't see Dash dodge, somepony else will. As crazy as her antics are, this is Pinkie at her most logical. Rainbow's intentions are laid out in the third act. No, she doesn't like pies at all, but she's dedicated to Pinkie's happiness at thinking she enjoys her pies. In a twisted sort of way, Dash's loyalty is driving her deception. Her flaw, as Applejack points out, is thinking her dislike for pie would crush Pinkie more than the feelings of betrayal once the ruse is inevitably exposed. After all, she's seen that Pinkie keeps files on everypony's likes and dislikes, so she should know Pinkie could just adapt and start giving her things she really enjoys. That being said, it's totally understandable how Dash got into this situation. Have you ever had it happen that you meet someone, they give their name, but you either miss it or can't remember it later? And before long they're in your circle of friends, hanging out, and eventually weeks or months have gone by... How embarrassing and insulting is it to have to ask their name at that point? And we all get into routines where we put up with some little annoying thing someone does, because it's not worth calling attention to, but as it continues, it starts driving you crazy but you can't object to it without raising the question of why you never said anything before. Why not just eat the pie? That may not be as easy as it sounds. There are foods I don't like that I can eat a few bites of to be polite, and there are foods I can't have in my mouth. Maybe it's the taste, maybe it's a pyschological aversion, but it seems Dash CANNOT eat pies. That makes the scene at the end all the more sacrificial. Back in season one, Rainbow didn't care as much for Pinkie and wasn't the greatest model of friendship generally. But by now, after all her character growth, Rainbow Dash should at least be feeling bad about having to do this. We don't get any of that, at least not before Dash is found out. Especially as she sees how obviously bothered Pinkie is, we ought to see Dash stressing out or perhaps going to another one of the Mane Six for advice. (It's not as though the story keeps the viewer in any suspense about what Dash is up to.) Dash's cavalier presentation in this episode is a little out of step with her character arc, which is a heavy mark against an otherwise wonderful episode. But thank you to whoever on the creative team had to go through 160-plus episodes and make sure Dash had never been shown eating a pie. I believe it may be implied in the Brotherhooves Social race, but there aren't any definitive instances I can think of. Lesson: A number of recent episodes, like Once Upon a Zeppelin, have our characters doing a noble thing in the wrong way, or for a misguided reason. Here we have a character doing a definitely wrong thing but for a reason that's well-intended, more or less. What we're facing here is a social lie or polite lie, not too different from the face-saving behavior we saw in Not Asking for Trouble. The intention is to avoid hurting someone's feelings. But the lie itself is hurtful here because once exposed, it detonates one of Pinkie's primary ways of loving her friend. With only a pretense of appreciation, all that effort, hundreds of times over a period of years, has been coldly discarded. And as mentioned above, if Dash had simply told Pinkie early on that she didn't like pies, Pinkie could have been making her genuinely happy in more effective ways this whole time. This is a pretty ridiculous episode, but I dare say this sort of thing happens in real-life relationships all the time. We tend to love people the way we like to be loved, and to express apprecation in our own dialect, which may or may not reach the heart of another person the way it would our own. So when we receive a poorly chosen gift or a well-intended compliment that touches a nerve, when someone spends too much time with us, forwards cascades of mildly funny emails, or does a chore for us that we really would have preferred to do ourselves, we've been taught to just smile and say thank you. In a long-term relationship, repeated instances of this can put us in the same position as Rainbow and Pinkie, until a scene of "I thought you loved those" finally plays out. We need to be honest from the get-go, or if that ship has sailed, perhaps there can be a "safe time" where we can come clean about little things with a promise of acceptance and understanding. There's a different sort of lesson present at the end of the episode that may throw first-time viewers for a loop. The standard "lying is bad" lesson is interrupted by Pinkie's instant forgiveness because...well, let's think about why. Pinkie Pie defended making such elaborate pies by saying, "It's worth all the trouble to see her happy." By the ridiculous measures Dash undertook to get rid of pies without Pinkie noticing, Dash was going to the same degree of trouble for the same reason. That doesn't make it right; the show goes to great lengths to point that out both verbally from multiple characters and by example as we see how Pinkie frets throughout the episode. But when one friend wrongs another, it's good to consider why she did what she did. In this particular case, Dash's words and her willingness to eat literal garbage were sufficient for Pinkie to see that they could move beyond this. Is it maybe a bit too quick and unqualified? Perhaps, but it seems like something Pinkie would do. That ending may not satisfy everybody, but I think it's a mature approach to relational conflict that goes beyond the black-and-white dos and don'ts that make for a simpler story. Resonance: From time to time, I've mentioned yummy food in this section. The pie Dash conjures up deserves mention as being the opposite of yummy. Humor abounds in this episode. The Pinkie faces are most extreme we've seen yet, and I love her interactions with the Wonderbolts. Funny moments that stand out for me include the x-ray of Tank, Dr. Fauna's suggestion of a pie pan-demic, the callback to the runway rule from Newbie Dash, Pinkie's conclusion that Rainbow can't be brainwashed because she hates washing, her explanation that Rainbow's never heard of Unofficial "Wake Your Friends Up" Day because it's unofficial, Rainbow's bed mane, and Pinkie's very detailed pieling system. 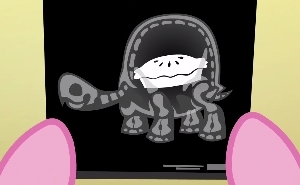 The imagine spot with Evil Dash is funny in itself but also sad for its insight into how betrayed Pinkie feels. For all their flaws, the devotion that both Rainbow Dash and Pinkie Pie show for their friendship is heartwarming. Considering the lengths to which Dash goes to avoid eating pies under any circumstances, pie must be really gross to her. It's therefore remarkable that Dash concedes to AJ that she should've just eaten the pies in the first place. Pinkie's friendship really does mean that much to her, and that's what gives her the idea for orchestrating her own comeuppance. Other Impressions and Final Assessment: I like how this episode returns to the suspicious Pinkie formula of previous episodes but has her be right this time, incorporating the lessons she learned in those very stories. 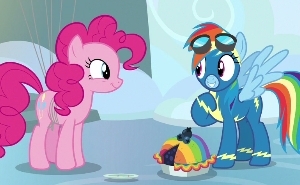 Given that one-bite, pan-and-all pie eating is pivotal to the plot, this is one of the most cartoonish MLPs to date, but it works thanks to Dash's previously established insane speed and Pinkie's familiarity with reality bending. There is one odd bit where a tunnel between Rainbow's bedroom and Tank's room seems to have an underground section even though her house floats in the sky. That's minor, though. My only real complaint in this episode is Dash's apparent comfort with lying to Pinkie at this stage in their relationship. That brings an otherwise Diamond-quality story down about to the level of their previous outing in Daring Done. Still, it's a wildly fun episode with a lesson that's good for generating discussion.